A comfortable couch is the centerpiece of your living room. Yet if your couch is uncomfortable or falling apart, it can negatively impact the entire room. Plus, if money is tight, it can be difficult to find a comfortable new couch that fits into your budget. You might believe that your only option is to look for rent-to-own couches, but there’s a better way. With the YES MONEY® program from Conn’s, you may be able to get the financing you need to buy your new couch without having to navigate the complicated world of rent-to-own sofas. Even if you’ve been turned down for credit somewhere else, YES MONEY® through Conn’s may be able to help you secure the money you need to get the couch of your dreams. If you’ve been searching for a rent-to-own couch online or in stores, you may already be aware that a rent-to-own living room set or rent-to-own individual piece of furniture can be a real hassle. Not only can you end up spending far more than the original cost of the item by the time you’re through, but the terms and conditions of a rent-to-own contract can be confusing and put your credit score at risk. If you’ve been trying to find a rent-to-own couch with no credit check, it’s easy to get lost in a sea of complicated information and offers without ever knowing which deal is the best one for you. None of that is an issue with YES MONEY® from Conn’s, however. Through the YES MONEY® program, we’ll do everything we can to connect you with financing for your new couch, sectional, loveseat or living room set. You could be qualified instantly* for up to $5,000 in financing, with the possibility of 0 percent interest for 12 months. You’ll be able to get the furniture you need for your living room without having to worry about the typical headaches that come with rent-to-own contracts. What’s more, unlike standard rent-to-own stores, the YES MONEY® program doesn’t limit you to a handful of styles to choose from. If you’ve been searching for a lease-to-own couch online but found only frustration, don’t worry. 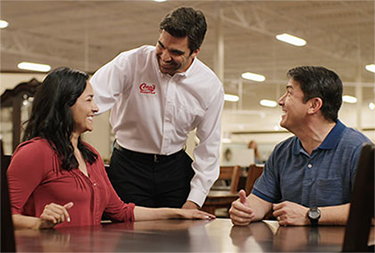 Come to Conn’s HomePlus and discover how the YES MONEY® program can help you find the new couch or other home furnishings you need.